The gods and goddesses of Egypt are such a diverse bunch. How does anyone start to classify them? Alphabetically? - a worthy, but essentially meaningless listing. In order of importance? – but Egypt’s deities wax and wane with the vagaries of fashion, and who is to decide which is the most powerful? Here Richard Wilkinson divides his subjects on the basis of appearance and so we get successive chapters on anthropomorphic (male and female) gods, animal gods (ranging from mammals to insects) and inanimate object deities, the latter being a rather short chapter encompassing just two celestial beings, ‘Aten’ and ‘moon’. 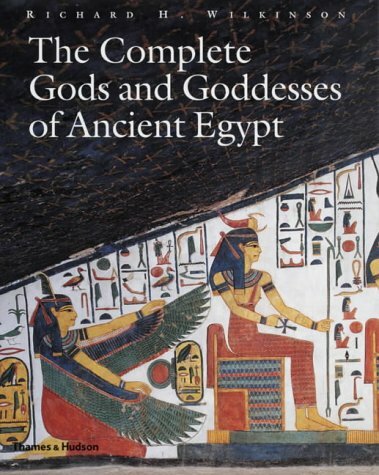 Although this leaves some scope for argument – Hathor is classed as ‘female anthropomorphic’ while her near identical predecessor Bat is found under ‘Mammalian’– cross-referencing solves potential confusions, and the finished product make splendid reading. In case anyone is wondering how a composite god would be treated under this system, it is the all-important head that proclaims the class. So the fierce Ammut, ‘great of death’ and ‘eater of hearts’(an unlikely but definitely frightening one third crocodile, one third lion and one third hippopotamus) may be found under crocodile. Reading through the beautifully illustrated text one is struck by the inexhaustibly elastic nature of the Egyptian pantheon. One feline deity was not enough – throughout their history the Egyptians worshipped at least sixteen (or seventeen if Ruty the twin lions is counted as two). These cats and lions prowled alongside eight bovine deities (excluding Hathor) and four rams, taking care not to step on the eleven serpents, three scorpions and one centipede which scurried and slithered at their paws. The reader is left with the definite suspicion that there may be many more unlikely animal deities, as yet unrecognised. In his opening chapters Richard Wilson addresses the development of this rich and unique spiritual world, tracing the rise and fall of the gods from the anthropomorphic images of prehistoric times to the arrival of Christianity. He then goes on to consider the daily care of the gods – the routines of feeding and dressing which were considered essential to the maintenance of the status quo, and the regular festivals which allowed the gods to escape from their dark and lonely temples. The chapter on popular religion and piety is tantalisingly short – this is a book in its own right – and balanced by a chapter discussing the relationship between the semi-divine king and his gods. It would be easy to make ‘the complete guide to anything’ into a dull listing of facts. It is to Richard Wilkinson’s credit that he has produced a highly enjoyable book, useful to anyone with an interest in the spiritual life of the ancient world. One of the pleasures of book reviewing is the anticipation at opening a volume whose subject and author seem perfectly matched. 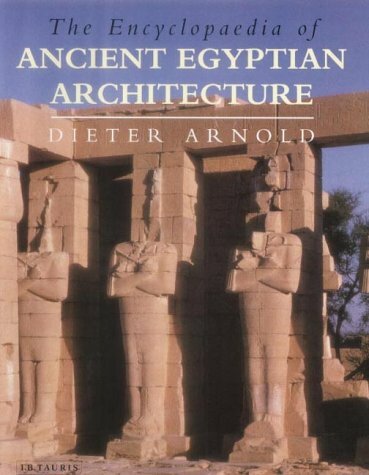 This is certainly the case with Dieter Arnold’s The Encyclopedia of Ancient Egyptian Architecture where the reader, searching for specific subjects or dipping in at random, benefits from Dr Arnold’s status as an unrivalled expert in the subject. The individual encyclopedia entries are fairly short, but pack a lot of detail into each. The cross-referencing within the text is excellent, allowing the reader to construct their own narrative on a particular subject by moving easily from entry to entry. Each entry also has a judicious selection of specific references for further research, with a more general bibliography at the back of the book. As an encyclopedia it fulfils its aims admirably. One minor quibble. The degree to which the volume has been updated since 1994 to take account of more recent work is a little uneven (nothing on the important ongoing work at Giza in the ‘Pyramid Town’entry , for example) but this is a minor charge against a book which is of outstanding importance to anyone interested in the built environment of ancient Egypt, from temples and tombs to towns and techniques of construction. This book, first published in hardback in 1995, then as a paperback in 1997 and now re-released as a ‘pocket sized edition’ (pockets belonging to a giant, presumably, as it is both larger and heavier than the majority of the paperbacks on my shelf*) raises an interesting question. What exactly is a dictionary? If, as the Oxford English Dictionary suggests, it is a book dealing with the words of a special subject, this volume should perhaps be reclassified as an encyclopaedia (O.E.D. : book giving information on all branches of one subject). There is far more to this dictionary than a dry listing of words. 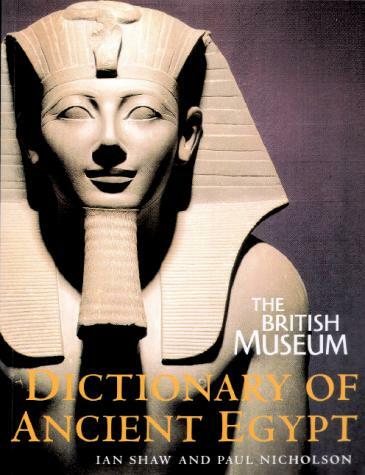 Beautifully produced on high quality paper, and with at least one excellent illustration on each double page, the dictionary provides a thorough review of ancient Egypt stretching from sun temple site of Abu Gurab to the pyramid-building king Zoser. Each entry is provided with a brief bibliography, and there are welldesigned maps and chronologies to help those new to the subject. The cross-referencing and the index are particularly helpful. Written with great fluency – I tried in vain to spot a difference in the writing styles of the two authors – the book will appeal to students and general readers alike and it makes excellent bedtime reading. Where else would you be able to read about Bastet, beards, beer and the mysterious Benben stone in the space of a few hundred words? I particularly liked the illustrated entry on imiut (gruesome fetish symbol consisting of the stuffed, headless skin of an animal tied to a pole) while my children enjoyed the curious bronze statue of Horus dressed in Roman armour which appears under ‘Romans’. The authors admit in their introduction that they had trouble deciding what, and what not, to include in their text. I bet they did. Ancient Egypt is filled with impressive sites, larger than life personalities and obscure specialist terms and a ‘pocket sized book’ can only grow so big before it becomes unwieldy. How does one decide to include Zawiyet el-Aryan but omit Zawiyet Umm el-Rakham (I thought I had found an obvious omission here, but used the index to find Rakham lurking under the heading of Mersa Matruah)? To include Hetepheres and not Khentkawes (who makes a brief appearance under the heading Abusir). As a reviewer I tried to catch the authors out, to find mistakes and omissions, but I failed and was suitably impressed. In summary, I would recommend this book to anyone interested in ancient Egypt. It gives excellent value for money. *Are vast ‘pocket sized’ books a purely Egyptological phenomenon, I wonder? Perhaps our editor should consider running a competition to spot the largest one currently in print? Any author attempting to write a book which intends to be an overview of a significant area of Egyptian funerary archaeology faces two major problems. The first is how to deal with the sheer quantity of available evidence: Egypt has produced more archaeological material – both buildings and objects – than any other part of the pre-Classical world, and the majority of that material is concerned in one way or another with mortuary practices. The high survival rate in the archaeological record is matched by a level of concern by the Egyptians to produce material remains for the welfare of their dead, and the construction of as large and well-equipped tomb as possible was at the top of their list of priorities. The choice of which of literally thousands of substantial and well-decorated tombs to select for description, discussion and interpretation is an intimidating one. The second problem, once this enormous corpus of material has been considered and sifted, is how to say anything usefully new about it. This is hardly a subject area which is short of published works for the general reader. 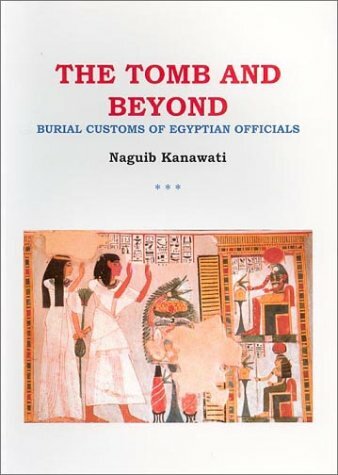 On the face of it Professor Kanawati’s book is much like many others, consisting of a general overview of Egyptian beliefs concerning the afterlife, a brief description of the development of tomb architecture during the dynastic period, and a section discussing the themes and content of tomb-scenes. Inevitably many well-known tombs and tomb-scenes are discussed and illustrated through line drawings and (occasionally rather muddy) halftones. But the thing which makes this book different from others on the same subject is the author’s intimate knowledge of much of the material he discusses, gained from a fieldwork career spent examining and recording dozens of private tombs. This is especially true of the late Old Kingdom at cemetery sites associated with Memphis (especially Saqqara) and important provincial centres (especially Hawawish and Deshasheh). The reader is unapologetically introduced, in admirable detail, to the tombs Professor Kanawati knows best and is shown how they can be used to demonstrate the different ways in which the Egyptians viewed the tomb as a machine for living forever.